Home décor accessories are pretty expensive items to purchase, that is why some home owners are reluctant to redecorate their home even after a few years has passed from the last time they design their home. However there are some way so you could redecorate your home within affordable budget by using do it yourself home décor. But since you create your own home décor, it means you must spend your free time to make it instead of playing or do other hobby that you may have. There are a lot of home décor that you could make yourself, some are inspired by popular brand which famous for their decoration items. You must know that Antropologie create very nice pillow with unique design such as their tassel pillow. However it also cost a huge load of money to purchase it, which is why you can try to create it yourself. Even though this item is a knock off item from that popular brand, but you would not see the difference from the real thing. Just remember to use high quality fabric for the main pillow cover then for the tassel you could use scrap fabric or wool thread. Another item which inspired from branded home decoration is this stripe acrylic picture frame which originates from Kate Spade’s design. This do it yourself home décor is pretty easy to create; all you need is an acrylic picture frame and electrical tape. Then you can just create stripe of black and white color on a white box using the electrical tape. But if you do not have white box then you might want to paint the box white before putting on the electrical tape. This nautical themed decoration is pretty popular in Pottery Barn, but as other branded item it is priced highly at $245. But actually you can try making it as do it yourself home décor project and only spend around $25. All you need is rope a few equipments, drill, foam ball, chopper pipe, lamp repairing kid and knowledge on how to do monkey fist knot. After the structure is complete you can put on your old lamp shade and it will look like new again. Moreover you can safe more than 200 dollars from this project. Ever see Restoration Hardware’s map which cost thousands of dollars? If you really want those maps then you can try this do it yourself home décor trick and save thousands of dollars on the process. What you need to do is to search an old map or any map that you want, and then print it with your computer printer. Use brown parchment paper if possible, since the map is big, you might need to divide them into several pieces. Then attach them on big plywood to be one big piece, frame the plywood if necessary. But you can also try to make the map into smaller pieces in separated frame for added style. Land of Nod has a cool lamp shade which look like an artwork. 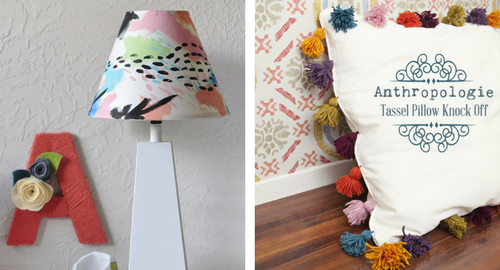 However you can actually do your own do it yourself home décor artwork to create the same lamp shade. All you need to do is to paint your old lamp following the original pattern, it is alright if it is not similar just do anything that you want. Or you can also use other design and match the lamp shade with the surrounding room color. Pottery barn has a lot of paper towel design which is very beautiful, surely you can get them only for $50 but if you can make it yourself then you will spend even less than that. Just follow the design that you desire and search for any do it yourself home décor tutorial online which is very easy to be found. Most of the time the materials are also very easy since you could find it on your local craft store. If you have not make any do it yourself home decor project before, then it is better to start with easiest project first. Try to find some project that does not need any sew, stitch, or other skilled work and only need glue to make. This will train you and make you accustomed to the work. Then you can try to make other project which requires higher skills. If you are confident with sewing or you have carpentry skill, then try to find project which suitable with your skill. That way you can enjoy making this do it yourself home décor. Think of main items that will surely useful for your house so you would not waste any material.